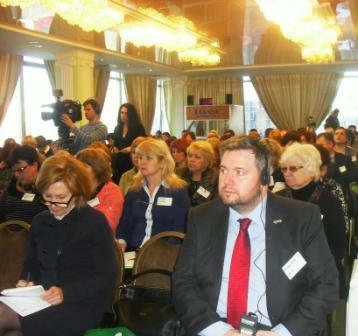 On February 18, an international conference took place in Kyiv summing up the results of the “Elder Abuse Prevention in Ukraine” project. Experts associated with the project noted that elderly people in Ukraine often suffer from financial injustices, neglect, or even physical abuse. These members of society may, for example, be faced with situations where someone is trying to steal from them or deprive them of property. There are occasionally even cases of physical violence against elderly people. The “Elder Abuse Prevention in Ukraine” project was implemented by the Ukrainian Charitable Organization, “Turbota pro Litnih v Ukraini” (Age Concern Ukraine) (ACU), and the British organization, “Age UK”. The project was supported by the European Commission through the European Instrument for Democracy and Human Rights (EIDHR) programme. Hundreds ACU volunteers aged over 60 years took an active part in the project’s activities. They interviewed almost 1,500 seniors and found out that 15% of respondents complained of injustice at the hands of their own family members, and over 40% said that they faced injustice from government officials. Based on these findings, volunteers launched the ACU group, which is devoted to detecting incidences of elder abuse and providing assistance to victims. According to Polyakova, the survey also reveals that older people in Ukraine trust the police more than other officials. The police are more able to protect an elderly person than social workers who do not have the necessary tools. “Over 100 participants took part in our conference. Representatives of public administrations from different regions of Ukraine, social security authorities, and international organisations accepted our invitation. Representatives from six different countries attended the conference. We are pleased that there is such a large number of stakeholders working to solve this problem, because it does require a collaborative approach,” – Polyakova noted. One of the results of the project was that local authorities established executive committees devoted to helping older people who are suffering various kinds of harm. This model was borrowed from the UK. Executive committees combine the efforts of different professional groups, including doctors, social workers, police and local authorities, and have no cost to government. They work together on a weekly basis when required. The experience gained has been analysed by experts from the Ministry of Social Affairs, which recommended this model be used in Ukraine. So far, these committees have been established in Mykolayiv, Khmelnytsky, Glukhiv, and several regions of Crimea. ← What can the EU agricultural land market practice offer?